I was in with Rose awhile in eve. Tuesday September 9 Pleasantest day for long time. Mer reaching 70°+ once more, all moving along as usual, as to work Lena ironing most of A.M. I spent time at little mending, odd jobs as usual, looking over furs, thinking about having them made over, I went down town early in P.M. to see Mrs Connor about sending few of Mrs Howe bo't baskets. I bro't them up home she filled them with necessaries, & I went with her to present them to Rose_ & May. 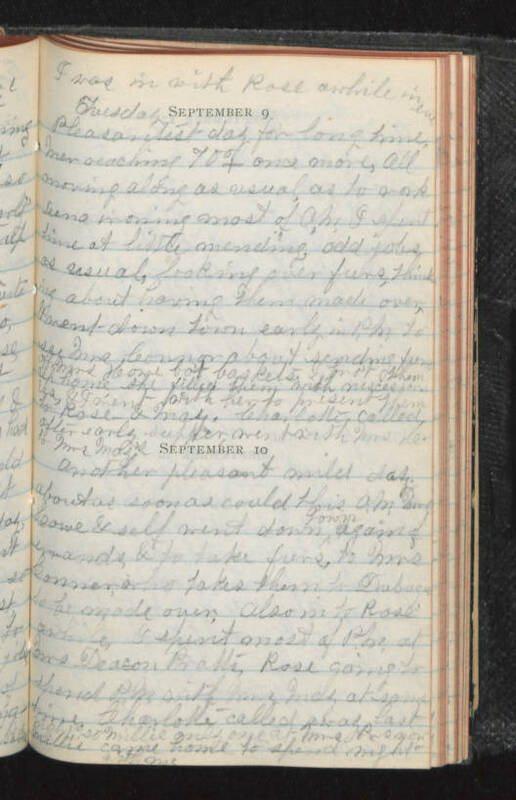 Charlotte called after early supper, went with Mrs H to Mrs Maz's September 10 Another pleasant mild day, about as soon as could this A.M. Mrs Howe & self went down town again of errands, & to take furs to Mrs Connor who takes them to Dubuque to be made over. Also in to Rose' awhile & spent most of P.M. at Mrs Deacon Pratts, Rose going to spend P.M. with Mrs (?) at same time. Charlotte called away last night so Millie only one at Mrs H_'s Millie came home to spend night with me.